Product Description: Organic and Nature's Natural Liquid Hand Soap helps keep your skin healthy, clean, soft, and moisturized. Our scented formula is ideal for sensitive skin, for people sensitive to scents and perfumes or for those with asthma or allergies. Why put toxics on your skin? This product is formulated with the safest natural ingredients available and contains no solvents, sulfates, glycols or phthalates. 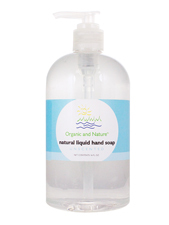 Organic and Nature's Natural Liquid Hand Soap contains no animal byproducts, scent or dyes. Organic and Nature: Because you're smart enough to stay healthy. Ingredients: Food-grade natural cleaning agents made with Glucoside (Sugar) form U.S. Corn, Cocoyl Amide (Coconut), Palm Fatty Acids, Natural Spring Water plus Organic Aloe Vera Gel. Does Not Contain: Solvents, Sulfates, Glycols, Phthalates, Animal Byproducts, Scents or Dyes.